I was just looking at our resident Jose Canseco Super Collector (1st4040) milestone thread regarding his new milestone of 1500 unique cards. A comment from bouwob about knowing only a handful of people that have reached that milestone got me wondering. Who else has 1500+ unique cards of their player in their player collection? Last edited by onionring9; 11-24-2017 at 11:02 PM. Plan to sell it for a profit before you get it in hand? No, I just do that with shatty players that don't fit in the pc. I'm only at 1300 or so. 1696 different Hanley's. Should join the 1700 club by the end of the mail week. do you have a photobucket or something? I do, but it is horribly out of date. I haven't updated it in forever, but one of my goals for this year is to get everything scanned. Use the links to the years on the left to actually see what's scanned. Almost nothing is scanned from 08. 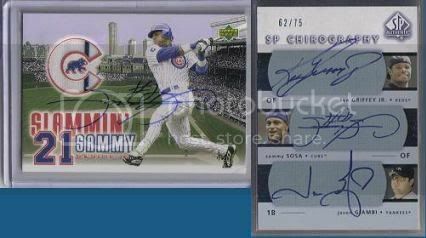 I'm at 2110 for Sammy Sosa. 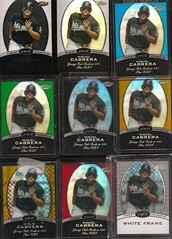 It isn't as impressive as Canseco because Sosa has an insane number of cards. Last I checked he was around 7500 unique cards. I'm closing in on 2,100 different Piazza's out of the 8,500 he has out there. I'm around 3300 of Andruw. Downsizing my AJ collection. If you are looking for a specific card (non-multi player), PM me, I may have it. it makes my milestone seem less impressive when you look at what some of you guys are up against in total beckett counts.. mine is only 2654 total recognized cards and its nice to be over 50% but of whats left there are a good amount of 1/1's included in that total..
my total card count with all my star sets and broder cards is over 2000 different unique cards. not too bad for not buying cards for 12 years.. I amassed my collection from 88-95 mostly and have added maybe 200-250 cards from 08-present. I know my brother (RickeyFanatic) is over the 1500 mark too with his collection. I just got to 1,650 different Alex Rodriguez cards the other night. So far, I've scanned from 1993-2004 in my bucket, as well as relics/autographs. 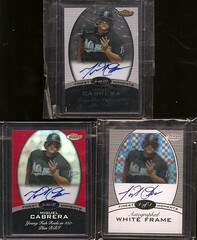 I've also got 1,380 different Jeters, but that collection has unintentionally taken a backseat to my A-Rod collection. Great collections, everyone. I'm especially impressed by the Andruw Jones collection. How long have you been going at it to get to over 3,000?